This chart shows essential chords and secondary minor chord relationships from all 12 root tunes for the soprano ukulele in G-C-E-A tuning. The chords shown for each root note are major, seventh, minor, diminished, and augmented, with relative minor I, IV, and V7 chords also shown. 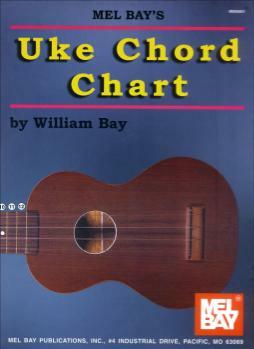 In addition, the chart includes a ukulele fingerboard with all the frets numbered and the corresponding notes shown in standard notation. Unfolds to 17.5" by 11.75".